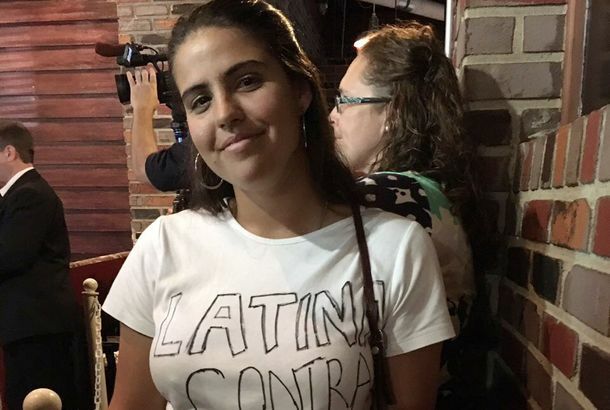 Trump and His Company Are No Aliens to Undocumented WorkersThe crackdown on undocumented workers at two of Trump’s clubs reveals the fake views at the heart of the president’s political career. Trump’s Crooked Foundation Dissolves, But Investigation ContinuesIt’s the grift that keeps on grifting. SNL Continues Its ‘Let’s Endearingly Emasculate Eric Trump’ Comedy JourneyCute race-car bed. 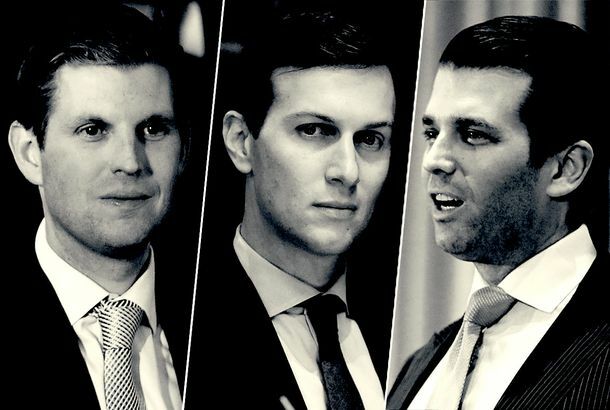 Big Boss Boys Donald Trump Jr. and His Brother Honored on #NationalBossDay“Happy #NationalBossDay to our boys,” the Trump Organization tweeted. Eric Trump Won’t Be Pleased by This Stephen Colbert ImpressionHe needs a lip lubricant. Jim Carrey’s Bizarre Anti-Trump Paintings Are … Some Kind of SomethingDo you prefer Eric Trump being impaled by an elephant tusk or his father bathing in a sewer? Eric Trump Says That His Father Only Sees GreenIn which the middle Trump son defends the president against claims that he’s racist. The GOP’s Plan to Get People to Wish Eric Trump a Happy Birthday FailedToday’s the big boy’s birthday. Eric Trump Suggests Ellen DeGeneres Is Part of the ‘Deep State’In which she joins forces with Barack Obama and Hillary Clinton. SNL Takes a Break From Mocking Donald Trump to Take on His Son, EricHe does everything painfully wrong during this WikiLeaks meeting. 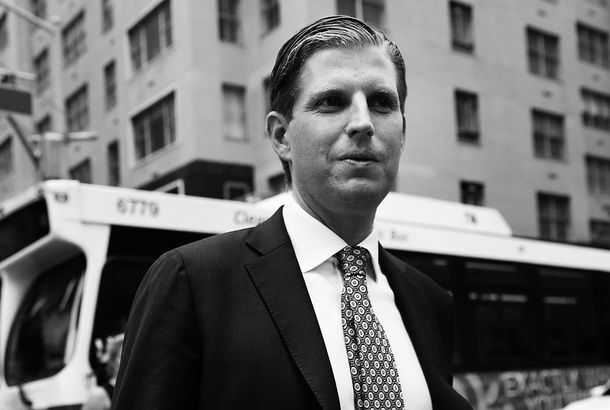 Eric Trump Says His Dad Ignores the Haters or Else He’d Get DepressedThe middle Trump son comes out against the press in defense of his father. Eric Trump Discovers the Glory of Fidget Spinners on ‘Weekend Update’Eric Trump is every 11-year-old. Trump’s Daughter-in-Law Launches Video Series to Praise the PresidentShe only reports “real” (a.k.a. positive) stories about the White House. 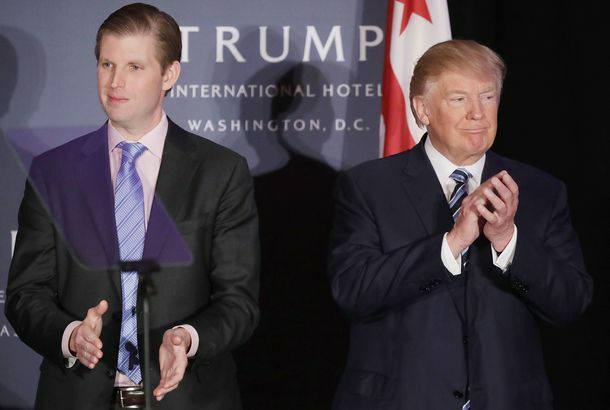 Did the Trump Organization Make Money From Eric Trump’s Cancer Charity?A report in Forbes suggests Eric Trump paid foundation money to the Trump Organization for expenses he told donors were nonexistent. Stephen Colbert Takes a Break From Donald Trump to Gibe Trump’s SonsNepotism, governor talks, oh my. Trump Vineyards Is Hiring and It Helps If You’re Foreign!Keeping jobs in America, as promised. Following Ethics Complaints, Eric Trump Will Stop Fundraising for His Charity“As unfortunate as it is, I understand the quagmire,” he said. Trump’s Tech Meeting Disrupted the Norms of Liberal DemocracyTrump promised to cede control of his company to his sons, Eric and Don Jr. Then, he invited them to a policy meeting with Silicon Valley titans. Eric Trump Was Heckled by Teens in New YorkTeens will save us all. Both Donald and Eric Trump Were Caught Spying on Their Wives’ BallotsVery nosy. It’s Time to Put Eric Trump in Selfie JailIt’s terrible that Eric Trump must be thrown in selfie prison for life for taking an illegal ballot selfie, but the law is clear. Trump Campaign’s Ideal World Is One in Which Women Don’t VoteEric Trump sent around an electorate map that excludes women. Eric Trump: My Dad’s ‘Alpha Personality’ Is Why He Bragged About Groping WomenTrump’s son excuses his sexist remarks with the same logic pickup artists use. Eric Trump’s Really at Wit’s End With His Workplace Harassment SituationEric screams for a long, long time. It’s primal and scary and sounds like a dying animal. 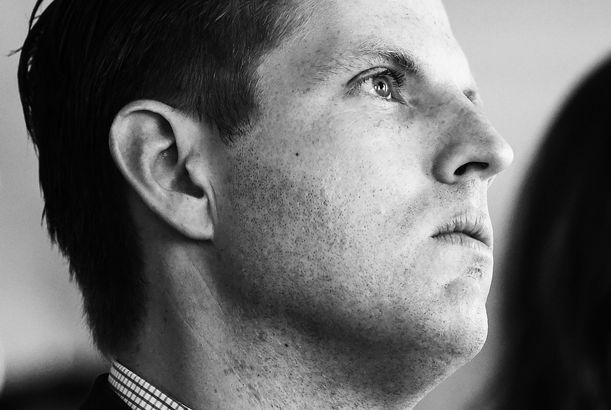 Eric Trump: Ivanka Too Strong to Be HarassedLike father, like son. Trump Campaign Floats Ivanka for VP Because ‘She’s Got the Looks’Oh, and she’s smart, too! Donald Trump’s Son Says ‘Waterboarding Happens on College Campuses Every Day’Maybe Trump thinks “waterboarding” is a synonym for heavy drinking. Jerry Seinfeld Now a Rabid Anti-TrumpiteHe pulls out of a charity event hosted by Donald Trump’s son because of the birther thing. Eric Trump Was ‘Blown Away’ By His Insane Birthday CakeNot literally, as the gun was made of frosting. Is Sam Ronson Supposed to Do Lesbian Benefits Just Because She Is One?Supposedly she turned down a benefit for a Village lady-bar. And will we see you at Steve Rubell’s cousin’s new Joan Crawford–themed club? More in today’s gossip roundup. The Old and New Schools Celebrate Atlantic City ProjectsThe Trumps throw a limoed-up party for Il Mulino’s new Taj Mahal location, and the Beatrice boys celebrate the Chelsea. Eric and Donald Trump Jr. Dine Everywhere From McDonald’s to DubaiAs partners in their father’s business, Eric Trump and Donald Trump Jr. do a lot of dining together — whether they’re talking to clients Stateside about Quattro, their upcoming restaurant in the Trump Soho building, or cutting ribbons in the Middle East as they did this week.